Listen to "English conversational questions and answers intermediate" on your iOS and Android device. Do you understand native English speakers? No? Would you like to understand them in future? Who wouldn’t like to understand native speakers and what they say. 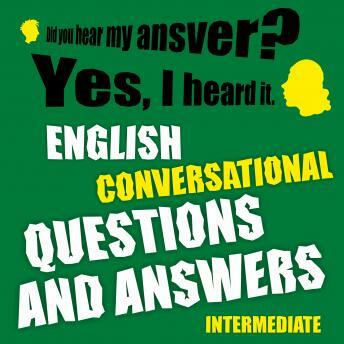 This audiobook English Conversational Questions and Answers - Intermediate is for everybody who would like to improve the ability to understand native speakers. This audiobook will probably not make you able to understand them fully now but it will improve your ability so in future you will be able to understand them. You will improve your conversational skills. You will listen every question two times. Pace is nor slow neither fast. It’s understandible for intermediate who don’t yet catch everything what native speakers say. You will enjoy your next holiday because you will make better questions and answers. You will also automatically practise grammar for intermediate. This level is easier than level of native speaker. It’s the next level after Elementary. Just listen a moment and see how it can help your English. For example when you drive a car. If you feel that your understanding of listening English is not great yet, buy this audiobook now.